Just over 24 hours after being released from a federal prison in Wisconsin, George Papadopoulos sat down for an interview Saturday at an upscale Washington, DC, hotel. His interviewer was right-wing personality Mike Cernovich. His audience at the American Priority Conference, some of them wearing QAnon shirts, had paid between $165 and $1,500 for three days of events with far-right provocateurs and “Make America Great Again” Twitter celebrities. Organizers gave out promo codes for “Covfefe coffee,” advertised as the caffeine of choice for “very stable geniuses” supporting President Donald Trump’s agenda. Fresh off his 12-day prison term for lying to the FBI, he seemed to enjoy regaling the audience of roughly 60 people for an hour with a detailed recounting of his experiences, from how he was shaving “half naked” when the FBI first appeared at his doorstep to being tricked into meeting shadowy intelligence officers all over Europe. After the event, a small crowd surrounded the couple, asking to take selfies. Unlike most other characters caught up in the probe into whether the Trump campaign assisted Russian interference in the 2016 election, most of whom had previous name recognition, connections, and established careers, the 31-year-old Papadopoulos is a unique case of pure Trump–Russia fame. Since becoming a household name after pleading guilty to lying to the FBI in October last year, Papadopoulos has lived in a strange bubble that is distinctively 2018. Opaque tweets about how “this scandal is much worse than anyone can imagine” landed him national TV appearances, an ex’s revenge allegedly took the form of a letter to the House Intelligence Committee, and family spats between his wife and his mother, played out on Twitter, turned into threats to write tell-all books. Tens of thousands of people retweeted posts in which he tossed around terms and names like Joseph Mifsud, Alexander Downer, and “FISA declassification” — which has a familiarity only found in niche online Trump–Russia sleuthing circles. As Saturday’s appearance showed, that notoriety does not easily translate to reality. The small crowd at what has been described as “CPAC for the MAGA set,” which should have been his target audience, at times seemed bored at his detailed account of the “Western intelligence plot” against him, stopping their livestreams and checking their phones. “I was more under scrutiny for helping Trump win than for anything nefarious I did against my country,” he said to the biggest applause of the event. According to court documents, Joseph Mifsud, a Maltese academic, told Papadopoulos that the Russians had thousands of emails from Democrats in April 2016, two months before the Democrats themselves were aware that their computer system had been hacked. Papadopoulos later shared the information with the Australian ambassador to the United Kingdom, whose government passed the information to US authorities. That information sparked the investigation that Mueller now leads. After a year of his coy hints that he would “expose the biggest political scandal in modern history” and tweets like “tick tock” and “PapaD is the key,” most mainstream figures seem to have determined that Papadopoulos has nothing left to reveal. For months, he and his wife have described their role in the investigation as a horrific ordeal that they can’t wait to put behind them — while also seeming to do everything possible to stay in the spotlight and prolong it. On TV and in articles, some who viewed him as a naive, ambitious young man who got caught up in the scandal have been giving him some free advice if he really wants a serious career: Lie low. Shut up. Get some real experience. Maybe get a PhD. Instead, Papadopoulos seems to be going the opposite route, sometimes appearing to audition to become a Fox News regular by hyping his role at the center of the scandal. “George is writing a book, and wants to go back into politics,” Mangiante told BuzzFeed News earlier this week, adding that they would live in Los Angeles, where she is working in the entertainment industry. 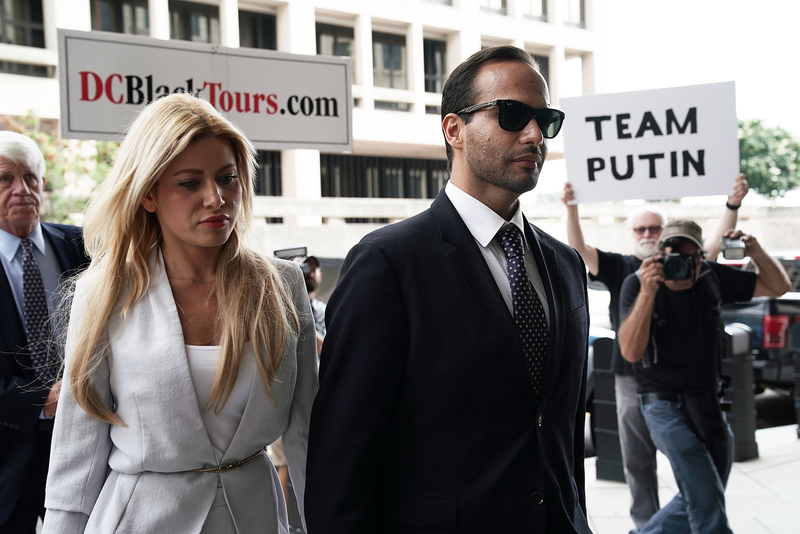 Mangiante was Papadopoulos’s main surrogate in several high-profile TV appearances over the last year, often asking Trump to pardon him and comparing her then-fiancé to John Dean, the Nixon White House counsel who pleaded guilty and then revealed much of the Watergate conspiracy to congressional hearings. The audience saw them as an inspirational story. “His talk was interesting, but that was my favorite part. I think it just shows the strength of their relationship, that she would still marry him and stick by him,” Sabine Durden, who attended the conference and spoke on a panel about illegal immigration, told BuzzFeed News. Mangiante, an Italian lawyer, model, and actor who met Papadopoulos on LinkedIn in April 2017 and married him a year later, has herself become a source of speculation for Twitter detectives and reporters. Much of it has been driven by her own often erratic use of the online platform, a messy tangle of frequently deleted tweets and cryptic messages about “abusive relationships” and puppet accounts. In another effect of Trump–Russia fame, what would usually be personal drama has sometimes spilled into the investigation. That same ex-girlfriend, Naz Aspro, was, according to Mangiante, the author of a recently revealed letter to Rep. Adam Schiff, the ranking Democratic member of the House Intelligence Committee, alleging that Papadopoulos had told her that he was working on “business deals with Russians” that would benefit him and Trump and that she had witnessed a phone call between the two. She told BuzzFeed News that their lawyer, Caroline Polisi, had confirmed Aspro’s identity to them. Despite multiple requests, Aspro did not provide BuzzFeed News with any evidence to support the claims contained in the letter she allegedly wrote to Schiff. Polisi did not respond to a request for comment. But earlier this year, during the course of four interviews with Aspro in London and dozens of WhatsApp and Facebook messages reviewed by BuzzFeed News, Aspro said Mangiante contacted her to hatch a plot to “expose” her husband. Mangiante told Aspro that she had deleted the tweets after being threatened by Papadopoulos’s family, who demanded that she claim she was hacked. He declined earlier this year to comment on the messages and did not return a request for comment Saturday. On Saturday, after some people on Twitter noticed that she had apparently forgotten to switch accounts before posting a message praising herself and saying she could “do better” than Papadopoulos, Mangiante deleted her account. But at their appearance in front of the American Priority conference crowd, Papadopoulos and Mangiante were all smiles. They did not regret the “intense” last year at the center of the Trump–Russia probe because it had brought them closer together, they said, and they looked forward to putting it all behind them. The title will be Deep State Target: How I Got Caught in the Crosshairs of the Plot to Bring Down President Trump. Of the five people BuzzFeed News asked at Saturday’s event whether they would be buying Papadopoulos’s book, one said yes. Nardelli contributed reporting to this story from London.